SAN DIEGO, Calif., December 11, 2012 - Trex Company, the industry leading manufacturer of wood-alternative decking and railing products, has recently named Cuker as their “Digital Agency of Record.” As Trex Company's official digital agency partner, Cuker will lead their online marketing initiatives beginning with a complete redesign of Trex.com. 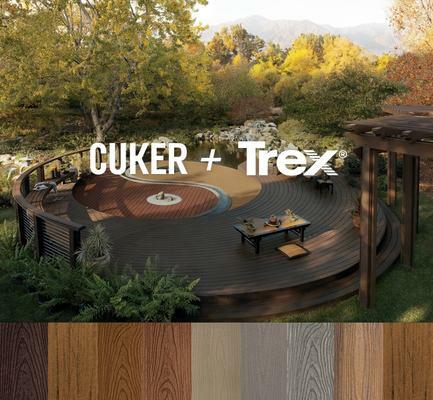 Trex Company is the world’s largest manufacturer of high performance wood-alternative decking and railing, with products stocked in over 5,500 retail locations worldwide. Trex’s high quality, low maintenance outdoor living products offer unsurpassed weather resistance and enduring beauty to enhance any outdoor space. Trex will partner with Cuker to launch a redesigned website with visuals and interactive tools to fully communicate the “Trex difference.” The new Trex.com will be an immersive, visual experience to engage both consumers and contractors throughout the purchase cycle. As Trex’s “Digital Agency of Record,” Cuker brings an award-winning approach and level of excellence within the manufacturing/home renovation industry. Cuker was recently honored with the prestigious “Best of Industry” award in Architecture from the Web Marketing Association’s WebAwards for the new website of Eldorado Stone, the world’s premier manufacturer of architectural stone veneer.